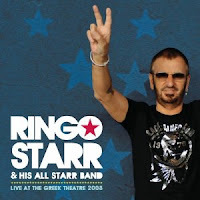 If you just can't get enough of Ringo Starr and his All Starr Band, you are so in luck! Live at the Greek Theatre 2008 is coming out next Tuesday on CD and DVD. Fun drinking game: take a swig every time Ringo flashes the peace sign. Good luck making it through more than two or three tunes! And don't forget he's touring now! Here's your chance to get your peace fingers in the next DVD likely to be released in 2012. Check out the remaining dates here.